Netflix Horror Spotlight brings you Wicked Horror’s top picks for what to watch on Netflix, whether it’s the latest indie darling, a classic masterpiece or a silly slasher that deserves a little bit more attention. In this edition, Joey Keogh suggests spending a night with the legendary Vincent Price in the House On Haunted Hill. We’ve collectively suffered through almost 25 years without the possibility of Vincent Price popping up in a horror movie to shake things up a bit, and it gets harder every day. His vast, and impressive, back catalogue makes it slightly easier, of course. Watching the brilliant House On Haunted Hill, in particular, either eases the pain or makes it harder depending on your point of view, but suffice to say a night spent with Price–especially in full-on classic Price mode–is better than one without. Although it’s a modest 75 minutes in length (shocking, by modern standards), House On Haunted Hill is still just as creepy, strange, and mysterious as it was when it debuted almost sixty years ago. Films this good simply do not age. They require consistent repeat viewings and, thanks to the magic of the home entertainment market, you can enjoy the flick on Netflix right now. The premise, which sees Price’s eccentric millionaire challenge five strangers to spend the night in a spooky, supposedly haunted, mansion in the middle of nowhere in order to bank ten grand a piece, is simple enough to require minimal setup while simultaneously eliciting maximum scare potential. The man himself even helpfully explains who everyone is as they arrive, his disembodied head bobbing up and down comically as though the idea these people might perish is hilarious to him (indeed, we later learn, it is). As is customary with the best haunted house movies, the featured property (the real life Ennis Brown House in Los Feliz, the setting for much spooky genre fare) is laid out like a maze, the camera twisting around corners so we’re never quite able to get our bearings as the characters get lost themselves. Although the fact it was filmed entirely in black and white may turn certain, younger viewers off, the aesthetic only adds to the bizarre, almost Clue (Cluedo, for Brits)-esque setup. The ace card of House On Haunted Hill is that it never quite confirms whether there are really ghosts in the house. An earth-shattering, expertly-placed jump scare is later revealed to be the work of less otherworldly beings while, elsewhere, simple things like doors closing by themselves, lights shutting off and a dripping ceiling establish the freaky atmosphere. There’s nary a spirit in sight and, aside from a head in a box and a vat of acid, there isn’t much in the way of gore. It’s all about the chilly atmosphere and the weirdness of the unknown. 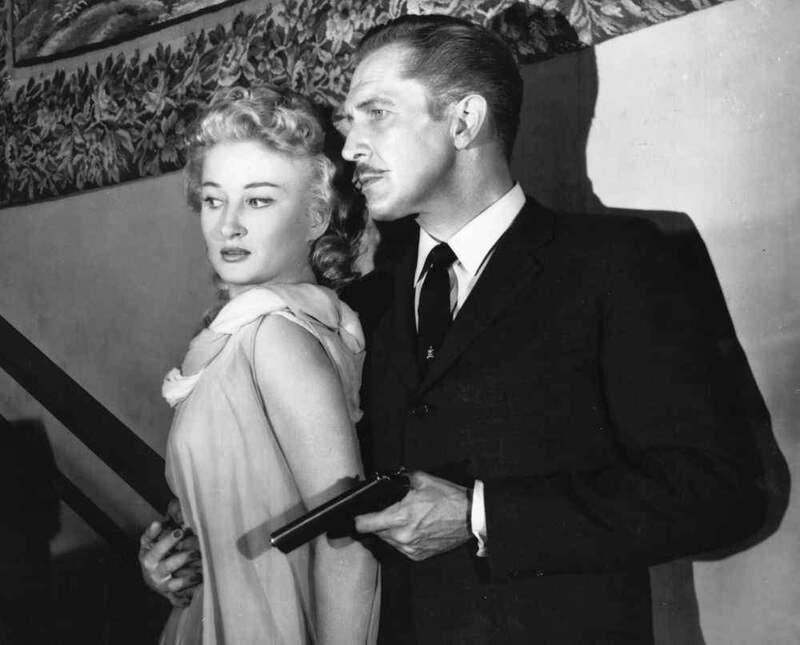 Although this is Price’s show, House On Haunted Hill benefits from a stellar performance from Carol Ohmart as his scheming wife, Annabelle, who fakes her own suicide and runs riot throughout the night, even as she insists she doesn’t want to take part in the “game” – party favours comprising of handguns in miniature ornamental coffins, that will later come into play significantly, are attributed to her also. The woman may be slightly unhinged, but she has a wicked sense of humour and Ohmart’s cracking chemistry with Price makes it impossible to guess who might emerge victorious. The flick has impressive team behind it. William Castle went on to direct Price in The Tingler, but he also helmed 13 Ghosts, while writer Robb White tackled the scripts on both, along with the so-called reboots of House On Haunted Hill and the still weirdly-titled Thir13en Ghosts, too. Their combined resumes are impressive, belying a certain understanding for the genre of which today’s so-called auteurs could only dream. By modern standards, House On Haunted Hill is relatively tame, with a respectably low body count. Now, we’re used to characters being picked off one by one but here, the premise is predicated on whether or not the ghosts are real and who is really pulling the strings. There’s a humanistic element to it that grounds the film in a horrifying reality. Although he’d probably be considered the villain of the piece, it’s Price’s Frederick who gets the last laugh and indeed he who ominously tells us “they’ll come for you” over the closing credits–again, hokey by modern standards, but classic in its own way. Considering the amount of absolute dross currently being passed off as horror, it’s nice to wrap yourself up in the warm blanket of a classic and House On Haunted Hill is a well-paced, creepy, and nicely old-fashioned yet completely ageless chiller. Vincent Price is just as captivating now as he was sixty years ago and, if all of his films were on Netflix, I’d gladly sit through each and every one. A must-watch now and forever that you can catch from the comfort of your living room.